Inasmuch as the example of holy men serves to detach the minds of devout hearers from transitory pleasures, and to excite them to the desire of eternal salvation, to the honour of God and of his most holy Mother, our Lady of St Mary, we will say a word concerning the graces wrought by the Holy Ghost in the soul of our holy brother Giles, who, even while he wore the secular habit, being touched by the Spirit of God, began to strive in all his actions to please God alone. At that time St Francis appeared as a new herald of Christ to give an example of holy living, of humility, and penance. Then, two years after his conversion, a man named Bernard, endowed with marvellous prudence and very rich in temporal goods, with Peter Cattani, was drawn by his example to the observance of evangelical poverty. 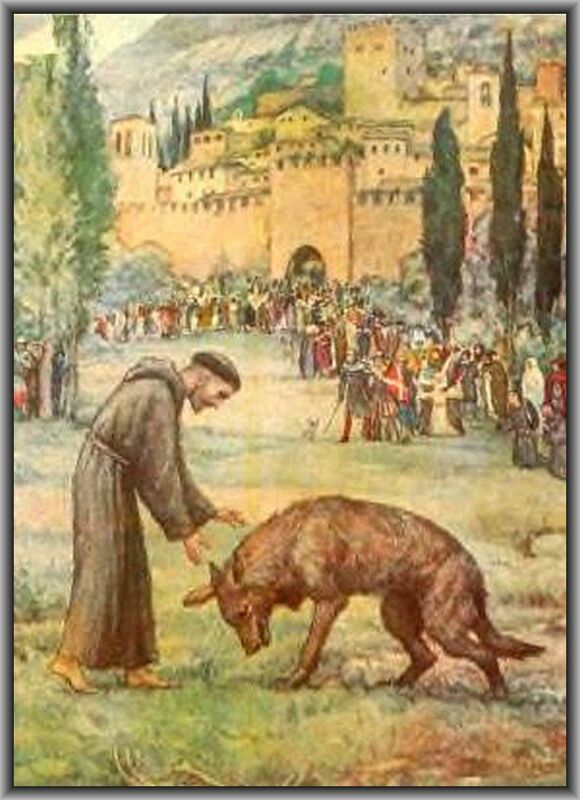 By the counsel of St Francis they distributed all their temporal possessions, for the love of God, among the poor, arraying themselves, in the glory of patience and evangelical perfection, with the habit of the Friars Minor; and all their life did they keep their promise then made with the greatest fervour and perfection. Eight days after their said conversion and distribution, Brother Giles, being still in the secular habit, and seeing the contempt of earthly things manifested by these noble knights of Assisi, to the great admiration of the whole world, on the Feast of St George in the year 1209, very early in the morning, as one in earnest about his salvation, went in great fervour of spirit to the church of St Gregory, where was the monastery of St Clare. 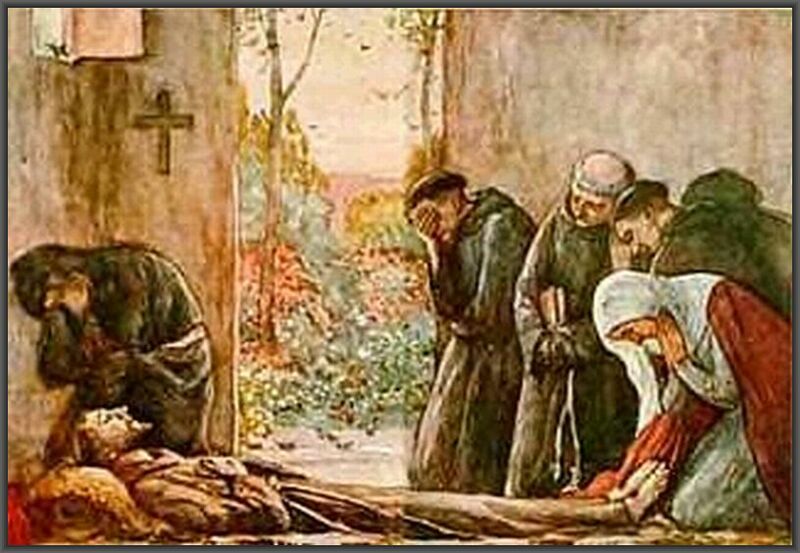 Being greatly desirous to see St Francis, he went, as soon as he had finished his prayers, towards the hospital for lepers, where St Francis dwelt apart in profound humility, with Brother Bernard and Brother Peter Cattani. Being come to a crossway, and not knowing which road to take, he prayed to Christ our precious guide, who led him straight to the hut. 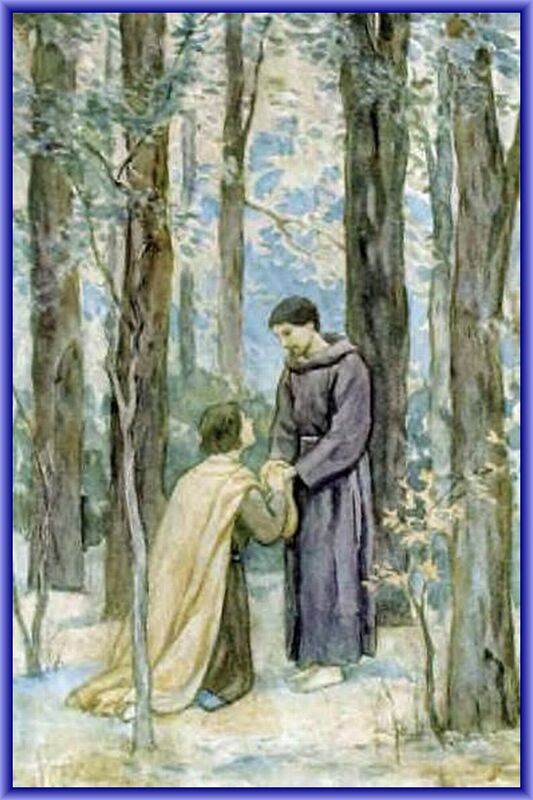 And as he pondered upon the cause of his coming, he met St Francis returning from the forest, where he had been praying. By the permission of St Francis, Brother Giles went once, in the process of time, to St James the Great, in Galicia, and in that whole journey he broke his fast once only because of the great poverty of the country. And as he went asking alms, and finding none who would give to him, he came one evening by chance to a barn, where a few beans lay scattered on the ground. These he gathered up, and supped on them; and in this barn he passed the night, for he loved to abide in solitary places remote from the haunts of men, the better to give himself to watching and prayer. And God so strengthened him by this supper, that if he had eaten of ever so rich a banquet he could not have been so well refreshed. Proceeding then upon his way, he met with a poor man, who asked an alms of him for the love of God. And Brother Giles, charitable as he was, had nothing to give but the habit he wore. So he cut the hood from his cloak, and gave it to that poor man for the love of God, and so journeyed on without a hood for twenty days together. And as he was returning through Lombardy, a man called to him, to whom he went willingly, expecting to receive an alms; but when he stretched out his hand, the man put a pair of dice into it, inviting him to play. Brother Giles replied very humbly, “God forgive thee, my son.” And as he passed through the world he met with much mockery and insult, and endured it all in peace. Brother Giles, by the permission of St Francis, went to visit the Holy Sepulchre of Christ; and being come to the port of Brindisi, he was obliged to tarry there many days, because there was on ship ready to sail. So Brother Giles, desiring to live by his labour, got a vessel, and, filling it with water, he went around the city, crying: “Who wants water?” And for his labour he received bread, and all things necessary for the bodily support of himself and his companion. Then he passed over the sea, and with great devotion visited the Sepulchre of Christ and the other Holy Places. And as he returned, he abode for some days in the city of Ancona; and because he was accustomed to live by his labour, he made baskets of rushes, and sold them, not for money, but for bread for himself and his companion; and he carried the dead to their burial for the same wages. And when even this failed him, he begged at the table of Jesus Christ, asking alms from door to door. And with so much labour and in poverty, he returned to St Mary of the Angels. When Brother Giles was once living in a convent of the Friars Minor at Rome, he desired, as he had done ever since his entrance into the Order, to employ himself in manual labour, and thus did he spend his day. Early in the morning he heard Mass with great devotion: then he went into a forest about eight miles out of Rome, and bringing home a great bundle of wood on his back, he sold it for bread and other provisions. One day as he was bringing home his load of wood, a lady met him and offered to buy it; so, having agreed with her as to the price, he carried it to her house. The lady, notwithstanding the agreement, seeing that he was a religious, gave him much more than she had promised. Then said Brother Giles: “Good lady, I would not have the vice of avarice to gain the mastery of me, therefore I will not take from thee more than we agreed upon.” And, instead of taking more than the stipulated sum, he took but half of it, and went his way, leaving the lady in great admiration. Brother Giles always showed the life scrupulous integrity in all his dealings. He helped the labourers to gather the olives and pluck the grapes. Being one day in the market-place, he heard a man asking another to help him to beat walnuts, offering him reward for so doing; but the other excused himself because the place was far off and difficult to access. Then Brother Giles said to him: “My friend, if thou wilt give me a part of the walnuts, I will come with thee to beat them.” So the agreement being made, he went with the man; and first making the sign of the cross, he climbed the high walnut tree, and in great fear began to beat. When he had finished beating, he gathered up more for his share than he knew how to carry; so taking off his habit, and tying the sleeves and the hood, he made a sack of it, and filling it with walnuts, he took it upon his back and carried it to Rome, and with great joy gave the walnuts to the poor for the love of God. When the corn was reaped, Brother Giles went with other poor persons to gather the ears of corn; and if any one offered him a handful of grain, he would say: “Brother, I have no granary wherein to store it, and for the most part, what I gather I give to the poor for the love of God.” Brother Giles had little leisure to help others at such times, for he had to fulfill his appointed task, and also to say the canonical hours, and make his mental prayer. When once he went to the fountain of San Sisto to fetch water for the monks of that place, a man asked him some water to drink. Brother Giles answered: “How can I take the vessel half filled to the monks?” On this the man, being angry, spoke many hard and reproachful words to Brother Giles, who returned very sorrowful to the monks. Then borrowing a large vessel, he came back forthwith to the fountain, and finding the man there, he said: “Take, my friend, and drink as much as thy soul desireth, and be not angry that it seemed to me unjust to take a scant measure of water to those holy monks.” Then he, being constrained and conscience-stricken by the charity and humility of Brother Giles, acknowledged his fault, and from that day forth held him in great reverence. HOW BROTHER GILES WAS MIRACULOUSLY ASSISTED IN A GREAT NECESSITY WHEN, BY REASON OF A HEAVY FALL OF SNOW, HE WAS HINDERED FROM GOING OUT TO QUEST. Brother Giles was once staying in Rome, at the house of a Cardinal, when Lent was drawing near; and being unable there to enjoy the quiet of mind which he desired, he said to the Cardinal: “My Father, I pray you give me permission to go with my companion to spend this Lent in some solitary place”; and the Cardinal answered him: “Alas! dearest brother, whither wouldst thou go? This is a time of great scarcity, and thou art not well accustomed to these desert places; wherefore I beseech thee remain with me, for I account it a singular grace to be permitted to provide for thy wants for the love of God.” But Brother Giles being determined to go, went out of Rome to a high mountain, where there had once been a castle, and where there was now a forsaken church dedicated to St Lawrence; this he entered with his companion, remaining there in prayer and meditation. They were not known in the place, wherefore little reverence or consideration was shown to them, so that they were in great poverty, and moreover a heavy fall of snow came on, which lasted many days. They could not leave the church; they had no food with them, neither was any thing brought them from without; and thus they remained shut up for three days and three nights. Brother Giles, seeing that he could earn nothing for his livelihood, nor go out to beg alms, said to his companion: “My dearest brother, let us cry aloud to the Lord, that of his loving pity he would provide for this our extreme necessity; for we have heard how many holy monks, being in great straits, have called upon God to provide for them in their need.” So, after their example, these two holy men betook themselves to prayer, beseeching God with all their hearts to provide a remedy for their distress; and God, who is all-compassionate, had regard to their faith, devotion, and simplicity in manner following: A certain man, casting his eyes upon the church where Brother Giles and his companion were shut up, said to himself by an inspiration from God: “It may be that some devout person is doing penance in that church, and by reason of the snow he can obtain no supply for his wants, and may perhaps die of hunger.” Wherefore, by the inspiration of the Holy Ghost he said: “Of a surety I will go and see if what I imagine be true or no.” So taking bread and a flask of wine, he went his way, and with great difficulty arrived at the church, where he found Brother Giles and his companion most devoutly absorbed in prayer; but so wasted were they with hunger that they looked rather like dead men than living; and he had great compassion for them, and having warmed and comforted them he returned and told his neighbours of the extremity and necessity of these friars, praying and exhorting them, for the love of God, to provide for their needs. Many, therefore, after his example, brought them bread and wine for the love of God, besides other things necessary for food, arranging also among themselves that, during that whole Lent, all things needful were provided for them. And Brother Giles, reflecting on the great mercy of God and the charity of these people, said to his companion: “Dearest brother, hitherto we have prayed to God to provide for our necessities, and he has heard us; now it behoveth us to give him thanks, and to pray for those who have fed us by their alms, and for all Christian people.” And such grace did God grant to the fervour and devotion of Brother Giles, that many, after his example, forsook this blind world, and many who had no vocation to religion did most austere penance in their own homes. On the vigil of St George, at the hour of Matins, fifty-two years being now elapsed since he received the habit of St Francis, the soul of Brother Giles was received by God into the glory of Paradise: to wit, on the Feast of St George. A holy man, who was praying when Brother Giles passed from this life, saw his soul, with a multitude of others newly freed from Purgatory, ascend into heaven; and he beheld Jesus Christ, with a multitude of angels, going to meet the soul of Brother Giles, and so ascending again with all those angels and blessed souls, and with the sound of a most ravishing melody, to heaven. While Brother Giles was lying sick, a few days before his death, a certain friar of St Dominic became sick unto death. Another friar, who was a friend of his, said to the sick brother: “My brother, I desire, if God permit, that after thy death thou return to me and tell me in what state thou art”; and the sick man promised to return if it should be possible. He died on the same day with Brother Giles, and after his death, he appeared to the living Friar Preacher, and said: “It is the will of God that I should fulfill my promise.” Then said the living man to the dead: “How is it with thee?” and the dead answered: “All is well; for I died on the very day that a holy Friar Minor, named Giles, passed from this life; to whom for his great sanctity Christ granted that he should carry with him to holy Paradise all the souls that were in Purgatory, among whom was I suffering great torment; and now, by the merits of the holy Brother Giles, I am delivered from them”; and having said this, he forthwith disappeared; and that friar revealed the vision to no man. But after a time this same friar fell sick, and immediately suspecting that God had struck him because he had not revealed the virtue and the glory of Brother Giles, he sent for the Friars Minor; and there came to him ten, two by two; and they being gathered together with the Friars Preachers, he declared to them with great devotion the aforesaid vision; and, diligent inquiry having been made, it was found that the two had indeed passed from this life on one and the same day. Brother Bonaventura of Bagnoreggio said of Brother Giles, that God had given him special graces, not only for himself, but for all those also who should recommend themselves to him with a devout intention in any spiritual need. He wrought many miracles, both in his lifetime and after his death, as appeareth by his legend, and he passed from this life on the Feast of St George, in the year 1252. He is buried at Perugia in the convent of the Friars Minor. The grace of God and the virtues which flow therefrom are a way and a ladder that leadeth to heaven; but vices and sins are a ladder and a way that leadeth to the depths of hell. Vices and sins are a venomous and a mortal poison, but virtues and good works are a salutary medicine. One grace leadeth on to another; and one vice leadeth on to another. Grace asketh not to be praised, and vice cannot endure to be despised. The mind reposeth tranquilly in humility, of whom patience is daughter. Holy purity of heart seeth God, and true devotion enjoyeth him. If thou lovest, thou shalt be loved. If thou servest, thou shalt be served. If thou fearest, thou shalt be feared. If thou doest good to others, fitting it is that others should do good unto thee. But blessed is he who truly loves, and desireth not to be loved again. Blessed is he who serves, and desireth not to be served. Blessed is he who doeth good to others, and desireth not that others should do good to him. But because these things are most sublime and high perfection, therefore they that are foolish cannot understand them nor attain thereto. Three things there are that are very sublime and very profitable, which he who has once acquired shall never fail. The first is, that thou bear willingly and gladly, for the love of Jesus Christ, every affliction that shall befall thee. The second is, that thou humble thyself daily in every thing thou doest, and in every thing thou seest. The third is, that thou love faithfully with all thy heart that invisible and supreme Good which thou canst not behold with thy bodily eyes. Those things which are most despised and decried by worldly men are most truly pleasing and acceptable to God and to his saints; and those things which are most loved and esteemed, and are most pleasing in the eyes of worldly men, are most despised, condemned, and hated by God and by his saints. This foul disorder proceedeth from human ignorance and malice; for wretched man loveth most those things which he ought to hate, and hateth those which he ought to love. No man can attain to any knowledge or understanding of God but by the virtue of holy humility; for the direct way to ascend is first to descend. All the perils and grievous falls which have happened in this world have arisen from nothing else but the uplifting of the head - that is, of the mind - by pride. This is proved by the fall of the devil, who was driven out of heaven; and by that of Adam, our first parent, who was banished from paradise by the uplifting of his head - that is, by disobedience. We see it also in the example of the Pharisee, of whom Christ speaketh in the Gospel, and in many others also. And so also the contrary truth - namely, that all the great blessings which have ever been bestowed upon the world have proceeded from abasement of the head, that is, from the humiliation of the mind - is proved by example of the blessed and most humble Virgin Mary, the publican, the good thief on the cross and many others in Holy Scripture. And, therefore, good it were if we could find some great and heavy weight, which, being tied round our neck, would draw us down to the earth, and force us to humble ourselves. A friar once said to Brother Giles: “Father, tell me, how can we avoid this pride?” To whom Brother Giles made this reply: “Rest assured, my brother, that thou canst never hope to be free from pride until thou hast first placed thy mouth where thou dost set thy feet; but if thou wilt well consider the gifts of God, thou wilt clearly see that thou hast reason to bow down thy head. And again, if thou wilt meditate on thy defects and thy manifold offenses against God, in all this thou wilt find reasons for humbling thyself. But woe to those who desire to be honoured in their unworthiness! He hath one degree of humility, who knoweth himself to be opposed to his own true good. He hath a second, who restoreth the goods of another to their proper owner, and doth not appropriate them to himself. For every virtue and every good thing which a man findeth in himself, instead of appropriating it to himself, he is bound to refer to God, from whom all graces and all good things do proceed. But every sinful passion of the soul, and every vice which a man findeth within himself, he should attribute to himself, considering that they all proceed from himself and his own malice, and from no other source. “Blessed is the man who knows and accounts himself to be vile in the eyes of God, and also in the sight of men. “Blessed is he who judges himself always and condemns himself, and none but himself; for he shall not be condemned in that last and terrible eternal judgment. Brother Giles said also: “Let him who would acquire and possess perfect peace and quiet of mind account every man his superior, and hold himself the inferior and subject to all. “Blessed is the man who, in his works and in his words, desires neither to be seen nor known for anything else but for that wherewith God hath adorned him. “Blessed is the man who knows how to keep and hide within his heart divine revelations and consolations; for there is nothing so secret but God can reveal it when it pleaseth him. If the most holy and perfect man in the world were to esteem and account himself to be the vilest and most miserable sinner in the world, this would be true humility. Brother Giles said again: “It seems to me that holy humility is like the thunderbolt; for, even as the thunderbolt striketh a terrible blow, crushing, breaking, and burning that whereon it lights, yet can we never find the thunderbolt itself, so does humility strike and disperse, burn up and consume every evil and vice and sin, and yet itself can nowhere be seen. He who fears not, shows that he has nothing to lose. The holy fear of God orders, governs, and rules the soul, and prepares it to receive his grace. If a man possesses any grace or any divine virtue, it is holy fear which preserves it to him. And he who has not yet acquired grace or virtue, acquires it by holy fear. The holy fear of God is a channel of divine grace, inasmuch as it quickly leads the soul wherein it dwells to the attainment of holiness and all divine graces. No creature that ever fell into sin would have so fallen had it possessed the holy fear of God. But this holy gift of fear is given only to the perfect, because the more perfect any man is, the more timorous and humble he is. Blessed is the man who looks upon this world as his prisonhouse, and bears in mind continually how grievously he has offended his Lord. Greatly ought a man to fear pride, lest it should give him a sudden thrust, and cause him to fall from the state of grace in which he is; for no man is ever secure from falling, so beset are we by foes; and these foes are the flatteries of this wretched world and of our own flesh, which, together with the devil, is the unrelenting enemy of our soul. A man has greater reason to fear being deluded and overcome by his own malice than by any other enemy. It is impossible for a man to attain to any divine grace or virtue, or to preserve therein, without holy fear. He who has not the fear of God within him is in great danger of eternal perdition. The fear of God makes a man to obey humbly and to bow his head beneath the yoke of obedience: and the more a man fears God, the more frequently he adores him. The gift of prayer is no small gift, to whomsoever it is given. The virtuous actions of men, how great soever they may seem to us, are not to be reckoned or rewarded after our judgment, but according to the judgment and good pleasure of God; for God looketh not to the number of works, but to the measure of humility and love. Our surest way, therefore, is always to love and to keep ourselves in humility; and never to trust in ourselves that we do any good, but always to distrust the thoughts which spring up in our own mind under the appearance of good. He who with steadfast humility and patience endureth tribulations for the fervent love of God, shall soon attain to great graces and virtues; he shall be lord of this world, and shall have an earnest of that glorious world which is to come. Everything which a man doth, be it good or evil, he doeth it unto himself. Therefore, be not thou offended with him who injures thee, but rather, in humble patience, sorrow only for his sin, having compassion on him, and praying fervently for him to God. For, in so far as a man is strong to suffer and endure injuries and tribulations patiently for the love of God, so great, and no greater, is he before God; and the weaker a man is to endure sufferings and adversities for the love of God, the less is he in the sight of God. If any man praise thee, speaking well of thee, render thou that praise unto God alone; and if any man reproach thee, speaking evil of thee, do thou help him by speaking of thyself still worse. If thou wouldst maintain thine own cause, strive to make it appear evil, and maintain that of thy companion good, ever accusing thyself and sincerely excusing thy neighbour. When anyone strives and contends with thee, if thou wouldst conquer, lose thy case, and losing it thou shalt conquer; for if thou wilt go to law to obtain the victory, when thou believest thou hast obtained it, thou shalt find thyself shamefully defeated. Wherefore, my brother, believe me assuredly that the certain way to gain is to lose. But if we endure not tribulation well, we shall never attain to consolation eternal. It is a meritorious thing and far more blessed to endure injuries and reproaches patiently, without murmuring, for the love of God, than to feed a hundred poor men, or to keep a perpetual fast. But what profits it a man, or how does it benefit him, to afflict his body with many fasts, vigils and disciplines, if he cannot endure a little injury from his neighbour? And yet from this might he derive greater reward and higher merit than from all the sufferings he could inflict upon himself of his own will; for to endure reproaches and injuries from our neighbour with humble and uncomplaining patience, will purge away our sins more speedily than they could be by a fountain of many tears. Blessed is the man who has ever before the eyes of his mind the remembrance of his sins and of the favours of God; for he will endure with patience all tribulations and adversities for which he expects so great consolation. The man who is truly humble looketh for no reward from God, but endeavours only to satisfy him in all things, knowing himself to be his debtor; every good thing which he hath he acknowledges to come from the free bounty of God, while every evil that befalleth him proceedeth from his sins alone. A friar once said to Brother Giles: “Father, what shall we do if some great adversity or tribulation befall us in these times?” To whom Brother Giles replied: “My brother, I would have thee to know, that if we be such as we ought to be, though the Lord should rain down stones and lightening from heaven, they could not harm or injure us; because, if a man be in truth such as he ought to be, every evil and tribulation will be turned to his good; for we know how the Apostle saith, that all things shall be turned to good for them that love God; and in like manner all things shall turn to the condemnation and punishment of the man of evil will. “If thou wouldst be saved and attain to eternal glory, desire not revenge, nor punishment of any creature; for the inheritance of the saints is ever to do good and to receive evil. If thou didst but know, indeed, how much and how grievously thou hast offended thy Creator, thou wouldst know that it is meet and right that all creatures should persecute thee, inflicting pain and sorrow upon thee, that so the offenses which thou hast offered to their Creator might be avenged. “The horse is a noble and useful creature; for in his swiftest course he suffers himself to be ruled, guided, and turned hither and thither, backwards and forwards, according to the will of the rider; so likewise should it be with the servant of God, who should suffer himself to be ruled, guided, turned and bent, according to the will of his superior; nay, of all others, for the love of Christ. The slothful man loseth both this world and the next, because he brings forth no fruit in himself, and is of no profit to others. It is impossible for a man to acquire any virtue without diligence and great labour. When thou canst stand in a place of safety, stand not in a place of danger. He standeth in a safe place who painfully and diligently labours and toils in God, and for the Lord his God, not for fear of punishment or hopes of reward, but for the love of God. The man who refuses to labour and suffer for the love of Christ, truly refuses to share the glory of Christ; and thus, inasmuch as diligence is useful and profitable to us, so is negligence hurtful and dangerous. As sloth is the way to hell, so is holy diligence the way to heaven. Most solicitous and diligent ought a man to be in acquiring and preserving virtue and the grace of God by constant faithful co-operation with the grace vouchsafed to him; for it often happens that he loses the fruit among the leaves, and the grain amid the straw. On some our good God graciously bestows fruit with but few leaves; to others He gives fruit and leaves together; others, again, there are, who have neither fruit nor leaves. It seems to me a greater thing to know well how to guard and secretly to preserve the fruits and graces vouchsafed to us by God, than to know how to obtain them; for though a man know well how to acquire and gather up wealth, yet, if he know not well how to store it up and to preserve it, he will never be rich; while another, who carefully treasures up what by little and little he has acquired, becomes a man of great wealth. Oh, how great a quantity of water the Tiber contain, did none of it flow away in other channels! Man asks of God an infinite gift, a gift which hath no measure and no bound, yet he will but love God by measure and within bounds. He who desires to be loved by God, and to receive from him an infinite, immense and superabundant reward, ought to love God supremely and immensely, and to serve him without limit or cessation. Blessed is he who loves God with all his heart and with all his mind, who labours and suffers with mind and body for the love of God, and yet seeks no reward under heaven, but accounts himself only to be his debtor. If one man were exceedingly poor and needy, and another were to say to him: “I will lend thee something very precious for the space of three days; and know, that if thou turn this thing to good account within the space of these three days, thou shalt gain infinite treasure, and become rich for evermore”; certain it is that this poor man would be most diligent in turning that precious thing to the best possible account. And so I say to thee, that the thing which God hath lent to us is our body, which is his goodness he hath lent for three days; inasmuch as our whole life here below may be compared to three days. If, then, thou wouldst be rich, and eternally enjoy the sweetness of his divine presence, strive to make the best profit thou canst of this loan from the hand of God for the space of these three days, to wit, of this thy body, which he hath lent thee for the brief space of thy mortal life; for if thou art not diligent to labour and traffic in this present life whilst yet thou hast time, thou shalt never enjoy everlasting riches, nor repose eternally in the peaceful rest of heaven. But if all the wealth of the world were in the hands of a man who made no use of it, either for himself or others, what would it profit either him or them? Assuredly it would be of no use or benefit whatsoever. On the other hand, a man who possesses little, by turning that little to good account, may bring forth abundant fruit, both for himself and for others. There is a proverb of this world which says: “Never set an empty pot to boil on the fire, expecting thy neighbour to come and fill it.” And in like manner the good God will not have thee to leave any grace empty and unused; because he never gives a single grace to any man that it should remain unused, but he gives it, on the contrary, that it should be filled and used by the performance of good works; for a good will is not sufficient unless a man fulfill it, carrying it into effect by good works. Blessed is the man whom no created thing can disedify; but more blessed is he who receiveth edification from everything which he sees and hears. Many sorrows and troubles shall befall the miserable man who sets his heart and desires upon earthly things, for which he forsakes and loses the things of heaven, and at last those of earth also. The eagle flieth very high; but if a weight be laid upon his wings, he can no longer soar aloft; and so by the weight of earthly things man is hindered from soaring on high, to wit, from attaining to perfection; but the wise man, who lays the weight of the remembrance of death and judgment on the wings of his heart, cannot fly and range freely amid the vanities of this world, lest they prove to him occasion of damnation. We see daily how men of the world toil and labour hard, placing themselves in many bodily dangers, to acquire its false riches; and then, after they have thus laboured and acquired, in a moment they die, and leave behind them all that they have gathered together in their lifetime. Therefore there is no dependence to be placed on this deceitful world, which deceiveth every man who trusteth in it, for it is a liar. But he who desires to be truly great and rich indeed, let him love and seek the true and eternal riches, which never satiate or weary or grow less. Let us take example from the beasts and birds, who, when they receive their food are content, and seek only what they need from hour to hour: and so also ought man to be content with what is barely sufficient temperately to supply his needs, asking no more. Brother Giles said that St Francis loved the ants less than any other animal, because of the great care they take in the summer to gather and lay up a store of grain against the winter, but that he said that he loved the birds far better, because they gathered nothing one day for another. But the ant giveth us n example that we should not remain idle in the summer-time of this present life, lest we be found empty and without fruit in the winter of the last and final judgment. O holy chastity, how good art thou! Truly precious art thou and thy savour is sweet! Wherefore the foolish understand not thy worth. Man is unable to posses in peace the great graces which he receives from God, because many things that are contrary, disturbing and hostile arise against those graces; for the more acceptable any man is to God, the more vehemently is he assailed and buffeted by the Evil One. In order, therefore, to correspond with the grace which he receives from God, he must maintain an unceasing warfare; for the fiercer the conflict, the more glorious shall be the victor’s crown. But we have not many conflicts, nor many impediments, nor many temptations, because as yet we have advanced but a little way in the spiritual life. True it is, however, that if a man walk warily and well in the way of God, he shall feel neither fatigue nor weariness in his journey; but the man who travels by the broad way of the world shall never be free from labour, weariness, anguish, tribulation and pain, even to the day of his death. Blessed is the man who feels a continual sorrow for his sins, weeping over them day and night in bitterness of heart, only because of the offence he has thereby offered to God. Blessed is the man who shall have always before his eyes the sorrows, pains, and afflictions of Jesus Christ, and who for his love shall neither desire nor receive any temporal consolation in this bitter and tempestuous world, until he cometh to the celestial consolation of life eternal, wherein all his desires shall be fulfilled in fulness of joy. A friar put to Brother Giles this question: “Father, why is it that a man is more disturbed by temptations during prayer than at any other time?” To which Brother Giles made answer as follows: “When a man has to bring any question for the determination of the judge, and goes to him for aid or counsel, his adversary no sooner hears of it than he straightway appears to oppose and resist his appeal, and to throw every obstacle in the way of his cause. So it is when a man goes to prayer, for he goes to seek help from God in the cause of his soul; and immediately there cometh his adversary the devil with his temptations, to make great opposition and resistance, using every effort, artifice and labour to hinder his prayer, lest it should prove acceptable in the sight of God, and to take from it all merit and all consolation. And this we may plainly see; for when we are speaking of worldly things and feel perhaps no temptation, nor experience any distraction of mind; but when we go to prayer to delight and console ourselves, we are suddenly pierced with many arrows, to wit, by divers temptations, which the devil putteth in our way in order to distract our mind, that the soul may have no delight or consolation in its converse with God.” Brother Giles said, furthermore, that a man in prayer ought to be like a good knight in battle, who, however hard pressed by his enemy, scorneth to leave the field, but resisteth manfully, striving to overcome his foe, that he may rejoice and triumph in the glory of victory. But if he should leave the battle for fear of wounds or death, assuredly he would meet with nothing but shame, confusion and dishonour. And so ought we to do, for we ought not to intermit our prayer for every temptation which may present itself, but resist courageously; for, as the Apostle says: “Blessed is the man that endureth temptation; for, when he hath overcome, he shall receive the crown of eternal life.” But if, because of temptations, a man abandon prayer, he will certainly be defeated, dishonoured and overcome by his adversary the devil. O thou servant of the heavenly King, who wouldst learn the mysteries and the profitable and virtuous lessons of holy spiritual doctrine, open wide the ears of thine understanding, receive with earnest desire of heart, and carefully lay up in the treasure-house of thy memory the precious store of these spiritual doctrines, warnings and admonitions, which now I unfold to thee; by the which thou shalt be illuminated and directed in thy journey on the way of the spiritual life, and shalt be defended from the malignant and subtle assaults of thy material and immaterial enemies: and so, with humble boldness, thou shalt steer thy course safely through the stormy sea of this present life, until thou shalt attain to the desired haven of salvation. Listen, then, my son, and note well what I say to thee. If thou wouldst see well, pluck out thine eyes and become blind; if thou wouldst hear well, become deaf; if thou wouldst speak well, become dumb; if thou wouldst work well, cut off thy hands, and labour with thy heart; if thou wouldst love well, hate thyself; if thou wouldst live well, mortify thyself; if thou wouldst gain much and become rich, lose and become poor; if thou wouldst enjoy thyself and take thine ease, afflict thyself, and continually fear and distrust thyself; if thou wouldst be exalted and had in honour, humble and reproach thyself; if thou wouldst be reverenced, despise thyself, and do reverence to those who despise and reproach thee; if thou wouldst always receive good, continually endure evil; if thou wouldst be blessed, desire that all men should curse thee and speak evil of thee; if thou wouldst enjoy true and eternal repose, labour and afflict thyself, and desire every kind of temporal suffering. Oh, what great wisdom is it to know and do all these things! but, because it is so high and so sublime, it is granted by God to few. But I say, of a truth, that if any man will study these things and carry them into effect, he will have no need to go to Paris or to Bologna to learn any other theology. For, if a man were to live a thousand years, and have no external action to perform, nor any word to speak with his tongue, I say that he would have enough to do within his own heart, in labouring internally at the purifying, governing, and justifying of his heart and of his mind. A man should not desire either to see, to hear, or to speak any thing but for profit of his soul. The man who knows not himself is not known. Woe to us, then, when we receive the gifts and graces of the Lord, and know not how to acknowledge them! Woe still greater to those who neither receive nor acknowledge them, nor care to receive or possess them! Man was made to the image of God, and changes as he wills; but the good God changeth never. The man who would know much, must labour much and humble himself much, abasing himself and bowing his head until his mouth be in the dust; and then will the Lord bestow on him great wisdom and knowledge. The highest wisdom is to do always that which is good, acting virtuously, and guarding carefully against every sin and every occasion of sin, and ever keeping in mind the judgments of God. Brother Giles said once to a man who desired to go to a school to learn secular knowledge: “My brother, wherefore wouldst thou go to this school? I would have thee to learn that the sum of all knowledge is to fear and to love, and these two things are sufficient for thee; for so much knowledge as he can use, and no more, is sufficient for a man. Busy not thyself in learning those things which may be useful to others, but study always and seek to use those which are profitable to thyself. For we often greatly desire knowledge by which we may aid others, and think little of that by which we may profit ourselves; and I say to thee, that the word of God dwelleth not with the speaker, nor with the hearer, but with the faithful doer thereof. Some men who cannot swim cast themselves in the water to save others from drowning, and so all of them are lost together. If thou dost not work out thine own salvation, how shalt thou work out that of thy neighbour? And if thou doest not thine own work well how shalt thou do the work of another man? for it is not credible that thou shouldest love the soul of another better than thine own. The man who speaketh good words and such as are profitable to the soul is truly the mouth of the Holy Ghost; and the man who speaketh evil and useless words is certainly the mouth of the devil. When good spiritual men meet at times to converse together, they should always discourse concerning the beauty of virtue, that they may increase in the love thereof, and that virtue may increase in them; that so delighting in it more and more, they may exercise themselves the more diligently in all virtues, and by this continual exercise may attain to a greater love of them; and by this love and this continual exercise and delight in virtue, they may ascend to an ever increasing and more fervent love of God, and to a higher degree in the spiritual life, thus obtaining from the Lord greater gifts and a larger measure of divine grace. The more strongly a man is tempted, the more needful it is that he speak continually of holiness and virtue; for as by means of unholy talk of evil things a man is easily led to do evil, so oftentimes by speaking of virtue a man is led and disposed to virtuous actions. But what shall we say of the good which proceedeth from virtue? It is such and so great that we cannot worthily express its sublime, admirable and infinite excellence. And again, what shall we say of evil, and of the eternal penalty which follows sin? For it is an abyss so fearful and so deep, that it is beyond the power of our mind to think, or of our mouth to speak. I do not think that there is less virtue in keeping silence well, than in speaking well; and therefore it seems to me that a man ought to have a neck as long as a crane’s, that, when he has to speak, his words may have a long way to travel before they reach his mouth; to wit, that when a man would speak, let him think and think again, and examine and re-examine very diligently, the how and the why, the time and the manner, the state and condition of his hearers, and his won motive and intention. What will it profit a man to fast much, and pray, to give alms, to afflict his body, and to have his soul filled with heavenly thoughts, if, after all, he come short of the desired and blessed haven of salvation, that is, of holy and steadfast perseverance? We may sometimes behold a fair and tall ship upon the waters, strong and newly built, and laden with a rich and regal freight; yet suddenly, by the rising of a tempest, or by lack of skill in the helmsman, that proud vessel sinks and perishes miserably, never reaching the desired haven. What avail then all its riches and strength and beauty, now woefully lost in the depths of the sea? A man of the world asked Brother Giles: “Father, what wouldst thou advise me to do - to enter Religion, or to remain and do good works in the world?” To whom Brother Giles thus replied: “My brother, it is certain that if a man knew of a great treasure lying hidden in a common field, he would not ask counsel of any one to ascertain whether or no he should take possession of it and carry it to his own house: how much more ought a man to strive and hasten with all care and diligence to possess himself of that heavenly treasure which is to be found in holy religious orders and spiritual congregations, without stopping to ask counsel of so many!” The secular, on receiving this answer, immediately distributed all that he possessed to the poor; and having thus stripped himself of all things, entered forthwith into Religion. Brother Giles added, moreover: “I account it no great matter for a man to enter into the king’s court; nor do I think it any great thing for a man to obtain certain graces or favours from the king; but it is a very great thing for him to be able to dwell and converse discreetly in the king’s court, persevering wisely and prudently in his service. The more strictly a Religious holds himself bound by the yoke of holy obedience for the love of God, the more abundantly will he bear fruit unto God; the more entirely subject he is to his Superior for the glory of God, the freer and the purer shall he be from sin. The truly obedient Religious is like a knight well mounted and well armed, who fearlessly and securely makes his way through the ranks of the enemy, because none of them can harm him. But he who obeys with murmuring and unwillingness is like a soldier who, entering the battle unarmed and ill-mounted, is soon thrown to the ground and wounded by his enemies, and, it may be, made captive or slain. The Religious who wishes to live according to his own will, shows that he desires to build his eternal abode in the lowest depths of hell. When the ox bows his head beneath the yoke, he ploughs the ground well, so that it will bring forth good fruit in due season; but when the ox strays about at his own pleasure, the land remains wild and uncultivated, and brings forth no fruit at the harvest. And so the Religious who bows his head beneath the yoke of holy obedience, bears much fruit in due season to the Lord his God; but he who obeys not his Superior from his heart, remains barren and wild and fruitless in his profession. Wise and magnanimous men bow their heads promptly, fearlessly and without hesitation beneath the yoke of holy obedience; but foolish and cowardly men struggle to withdraw their neck from the yoke, and refuse to obey any creature. I hold it to be greater perfection in a servant of God simply to obey his Superior for the reverence and love of God, than it would be to obey God himself were he to command him in his own Person; for he who is obedient to a Vicar of the Lord would assuredly be still more obedient to the Lord himself, were he to lay his commands upon him. He who having placed his neck under the yoke of holy obedience desires to withdraw from that obedience, in order to follow a life of greater perfection, in that man, I say, if he be not already well established in the virtue of obedience, such a desire is but a sign of great pride and presumption lurking secretly within his soul. Obedience is the way to attain to every good and every virtue; and disobedience is the way to every evil and to every vice. If a man had ever before the eyes of his mind the remembrance of death and of the final eternal judgment, and of the pains and torments of the lost souls, certain it is that he would never have a will to sin or to offend God. And if it were possible for a man to have lived from the beginning of the world until now, and in all that time to have endured every kind of adversity, tribulation, grief, sorrow and affliction, and so to die, and then his soul go to receive the eternal bliss of heaven, what harm would he have received from all the evil which he had endured during all that time past? Again, if for the same space of time a man had enjoyed every king of earthly pleasure and consolation, and then, when he came to die, his soul were to fall into the eternal torments of hell, what would all the good things profit him which he had enjoyed in the time past? --- "The wolf and the lamb shall feed together. They shall not hurt nor destroy in all my holy mountain, saith the Lord." --Isaiah 65:25.